Crossbody bag with adjustable strap and detachable tassel ornament. Flap with front zip pocket and magnetic snap closure. Interior phone pouch and zip pocket. Back slit pocket with magnetic snap. Silver hardware (Platinum, Lavender). Light gold hardware (Sand, Black). 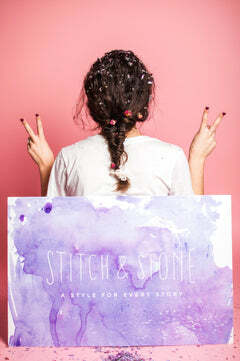 Get insider info on sales, new arrivals, and what goes on behind the scenes at Stitch & Stone.